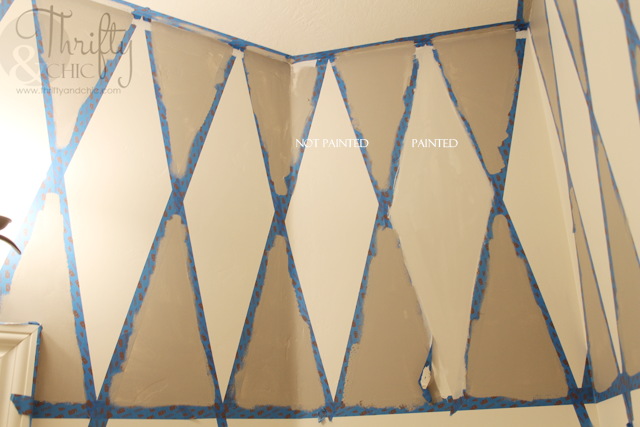 This post is brought to you in collaboration with ScotchBlueTM Painter’s Tape. All thoughts, opinions, and projects are my own. 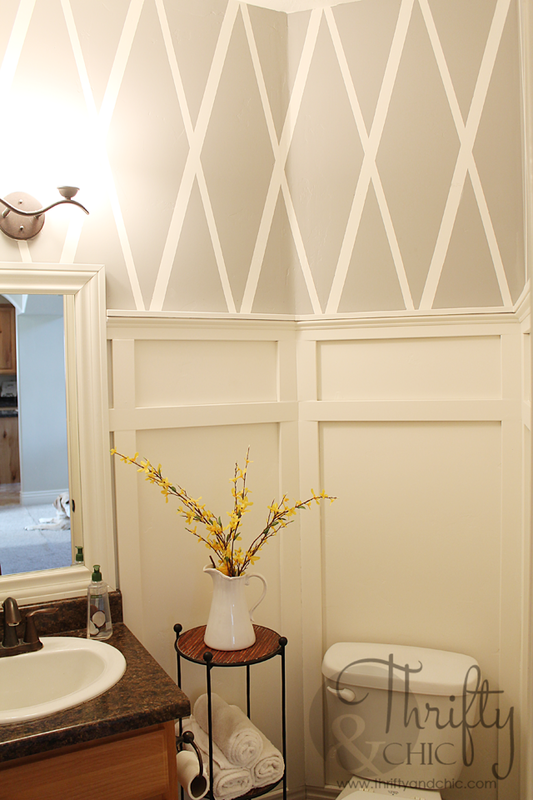 I've been wanting to do something with this bathroom for years now. It was just so boring...and beige. Very very beige. And since I'm pregnant, I decided to finally do something about lol ;) Cuz, why wouldn't I? 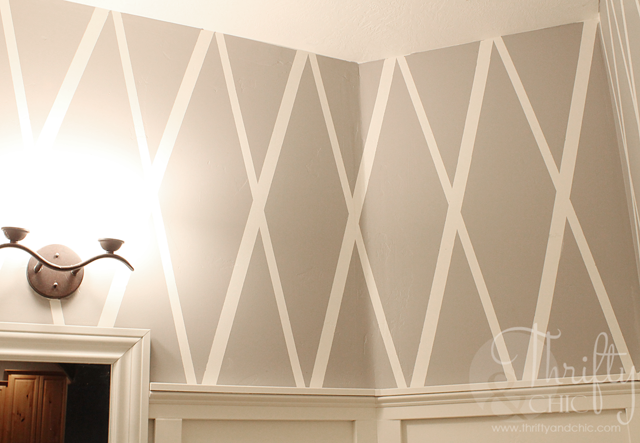 To get this awesome diamond pattern look, I partnered with ScotchBlueTM Painter’s Tape. 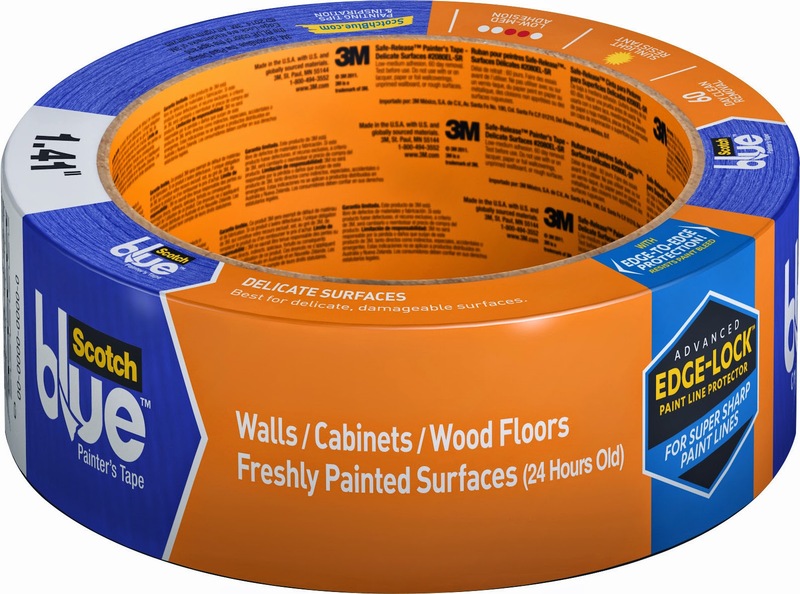 ScotchBlueTM Painter's Tape for Delicate Surfaces with Advanced Edge-Lock™ Paint Line Protector (#2080EL) in two widths. 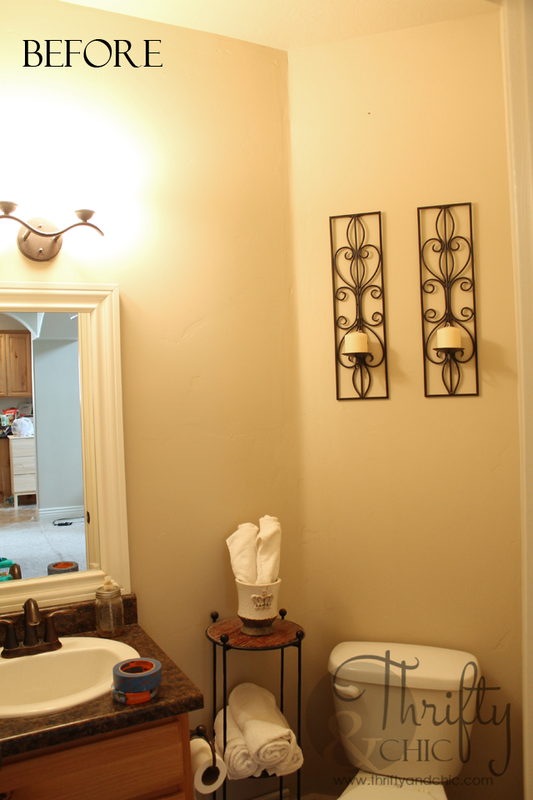 I used 1.41" and 0.94"
I first painted the whole bathroom white, taping off all the molding and the sink/cabinet. This alone was a big difference. Very stark though lol. 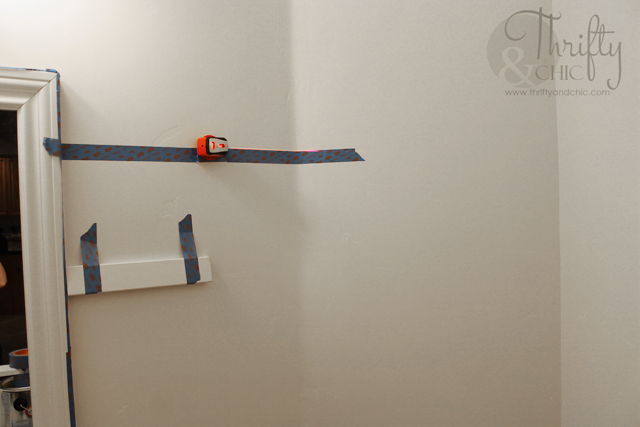 I then found where I wanted my board and batten and placed a line of painter's tape along there making sure it was level with my laser level. For the angle, I just placed a piece where I thought it looked good and went from there. I used my laser level to find that angle, since I would need to use that some opposing angle for the other crossing pieces. This angle ended up being about 101 degrees I believe. Once I got the angle up, I used a piece of paper to create the distance to the next piece of tape. I wanted them 11" across, so this was perfect. 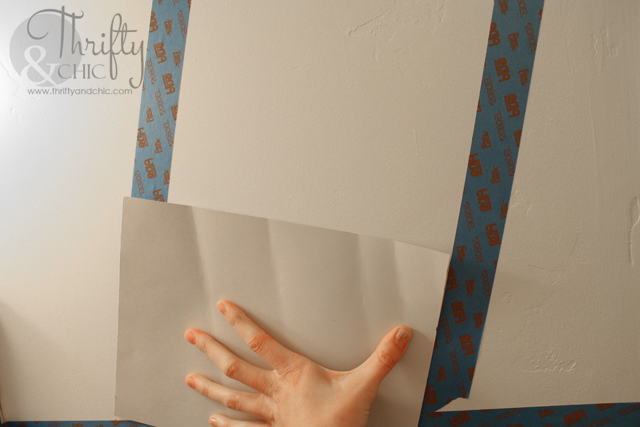 I lined up the left edge of the paper with the outside edge of the tape and penciled on a mark on the right edge. I did this all the way up the tape. 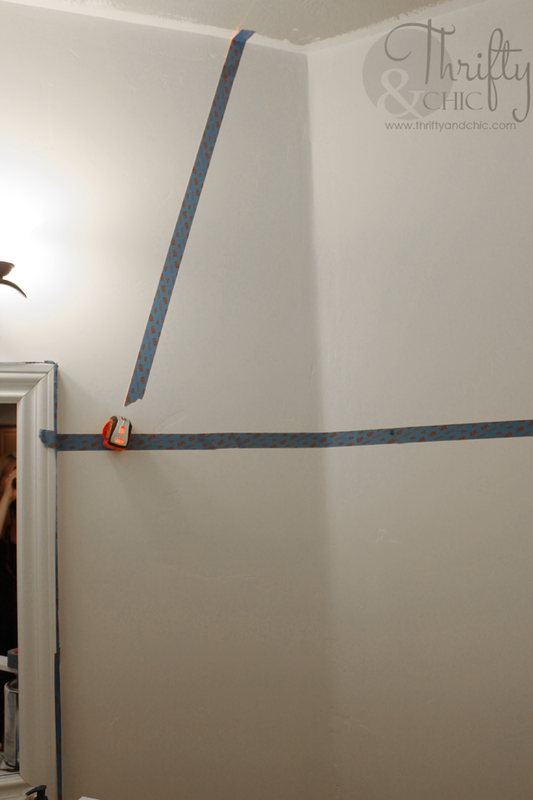 So, now that the marks were on the wall, this gave me the same exact angle and perfect distance for placing the parallel piece of tape. 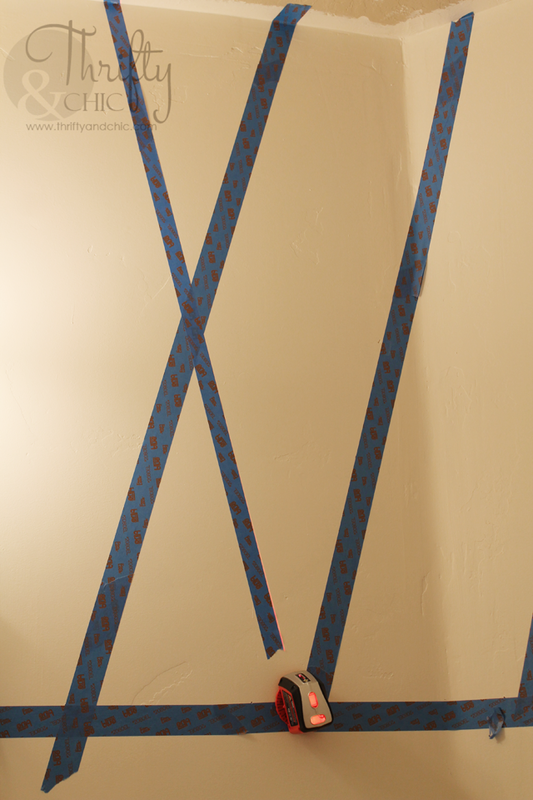 I just lined of the left edge of the tape on the marks. Here are all the tape pieces going one way. Now to start the next way. I used the smaller width of tape for these pieces. Found the opposing angle again with my laser level to get started. 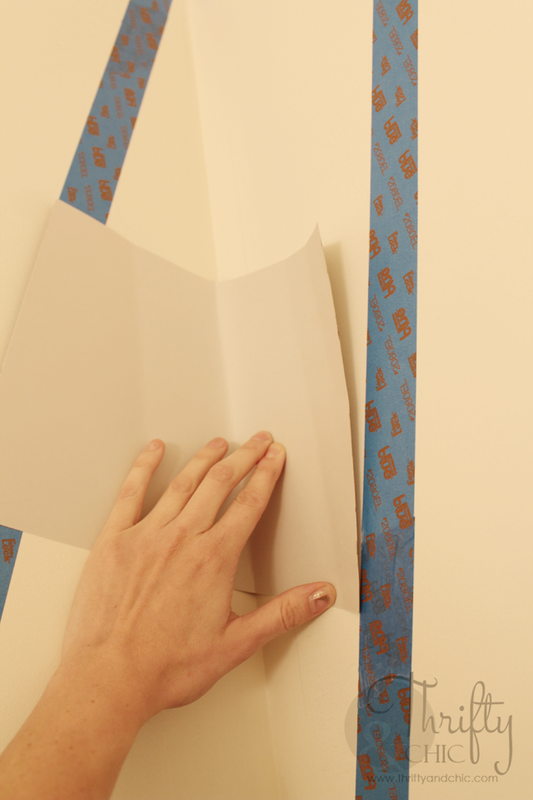 Then did the same thing as above with the paper for the parallel pieces. So, at first, I thought it would be cool to do two different colors for the diamond pattern. 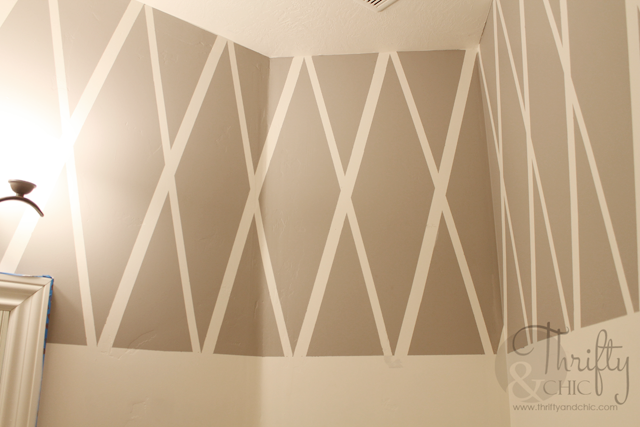 But the lighter grey color I chose was pretty much the color of the white wall...even after darkening it a bit. Here's how it looks after adding the board and batten (and yes, it's the same color as above...just different lighting apparently. I would say the true color is a mix between both). This bathroom had way too many angles. Well...4, like most rooms, which was fun to work around with a pattern :) But using the paper technique worked wonderfully and solved any problem I had prior. Here's how it looks in a complete 90 degree angle corner. And since I went around the whole upper wall, the pattern of course wouldn't meet up (although that would have been great!) 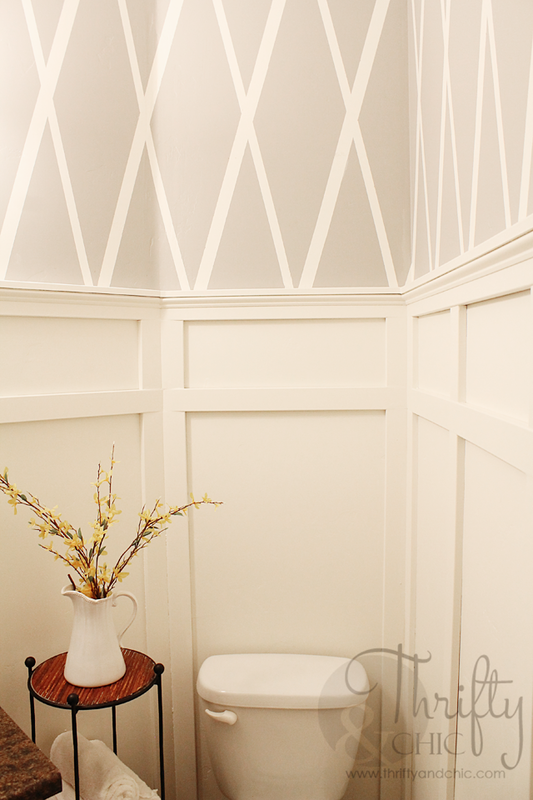 So, I chose to have the pattern merge in the smaller corner above the door. It looks like this, but it's so minimal, it's hard to notice. To get more diamonds, you just need to angle your lines differently. I lucked out having this pattern be perfect for one large diamond...that wasn't planned at all. And I love the interest it added with the dual width pieces of tape. Goodbye boring beige bathroom :) I think this was the last room that hadn't been touched by paint..well, I guess I have my living room...so, second to last. It's amazing I lived with it so blah for over 5 years. 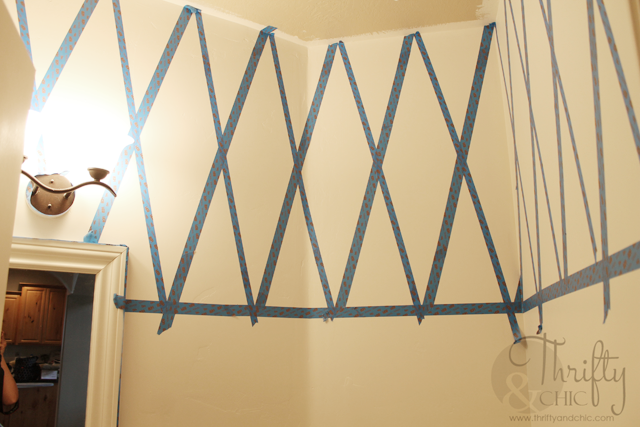 Enter the Home of ScotchBlue™ Painter’s Tape Contest now through November 15, 2014 and you could win $5,000 to put towards a home makeover! The first 500 to submit an eligible entry will receive one (1) roll of the new ScotchBlue™ Painter’s Tape with Advanced Edge-Lock™ Paint Line Protector! Check out this project as a featured project example in the contest! who are 18+ (19+ in AL & NE and 21+ in MS) at the time of entry. Void where prohibited. Enter from October 1, 2014 at 12:00:01 a.m. CT through 11:59:59 p.m. CT on November 15, 2014. All contest communications, entry/judging criteria and details subject to the full Official Rules. To enter and for Official Rules, visit www.scotchblue.com/homecontest. Sponsor: 3M Construction and Home Improvement Markets Division, St. Paul, MN. Be sure to check out The social pages for ScotchBlueTM ! 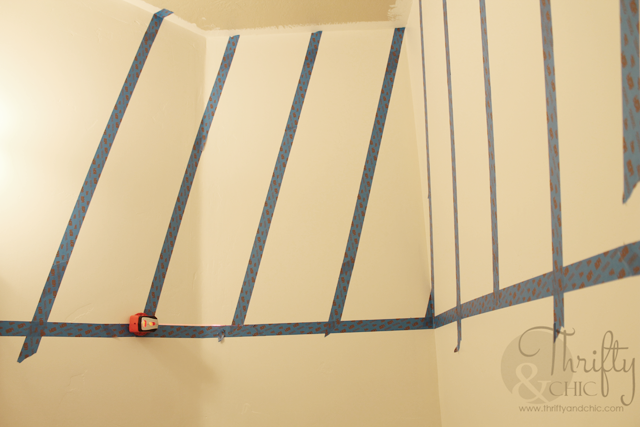 I am proud to be a 3M sponsored blogger, and, as part of my responsibilities, I get the opportunity to evaluate ScotchBlue™ Painter’s Tape. Opinions are my own and additional products used in the project were selected by me. Oh my goodness, this is stunning. I love it. I would love to have you link this up to my Inspire Me Tuesday party that is live now. I really love it all. This is beautiful! 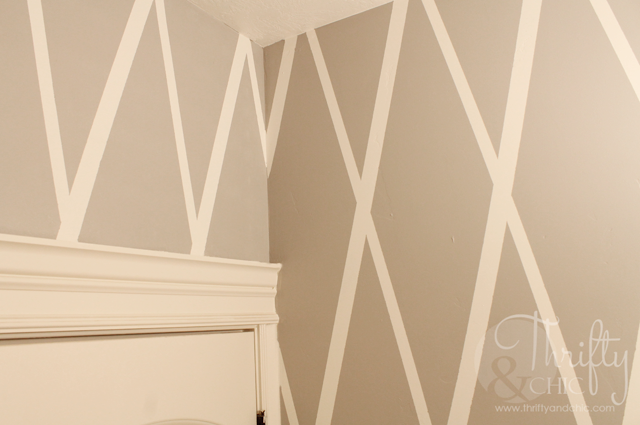 I want to do this in my sons bathroom. It's currently painted Home Depot orange. I don't know WHAT I was thinking when I did that. LOL! I love it! And I love the pretty landscaping. 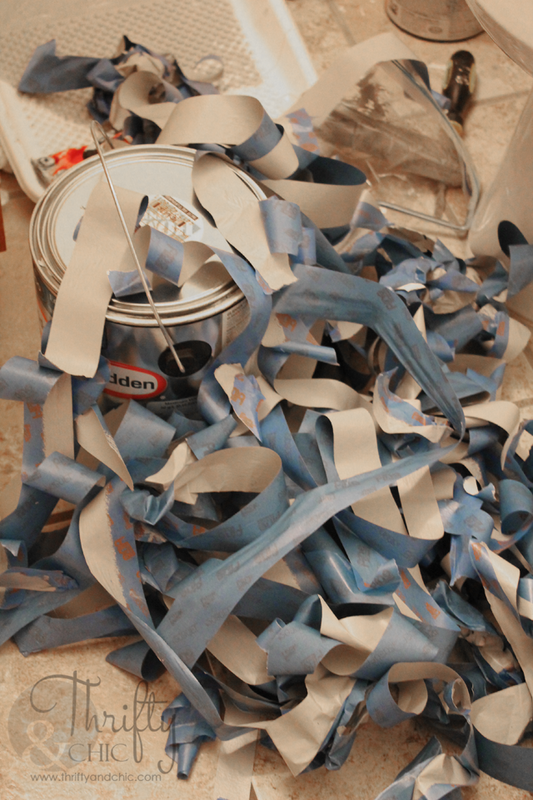 I love your paint colors. It looks to be very easy to do.There are very nice colors.I like it! Congratulations! You did a really good job. That's a good idea to decorate your bathroom. It looks more beautiful now. I love its color. 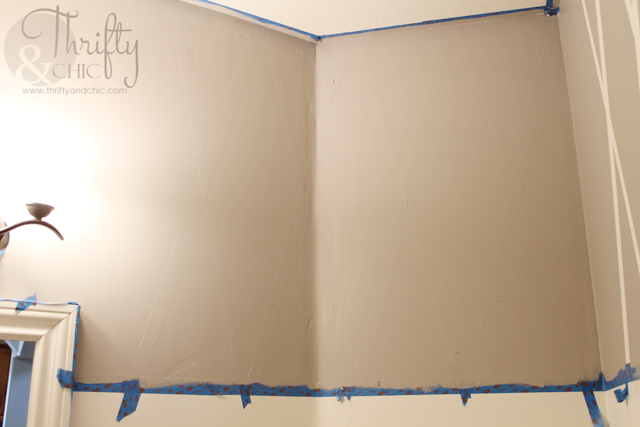 The supply list is super simple and this project looks to be very easy to do. But final result is so awesome and beautiful. I love it! Great idea! Thanks for sharing your experiences. I like this diamond style. I will do it on this weekend. Wow, it looked absolutely elegant! 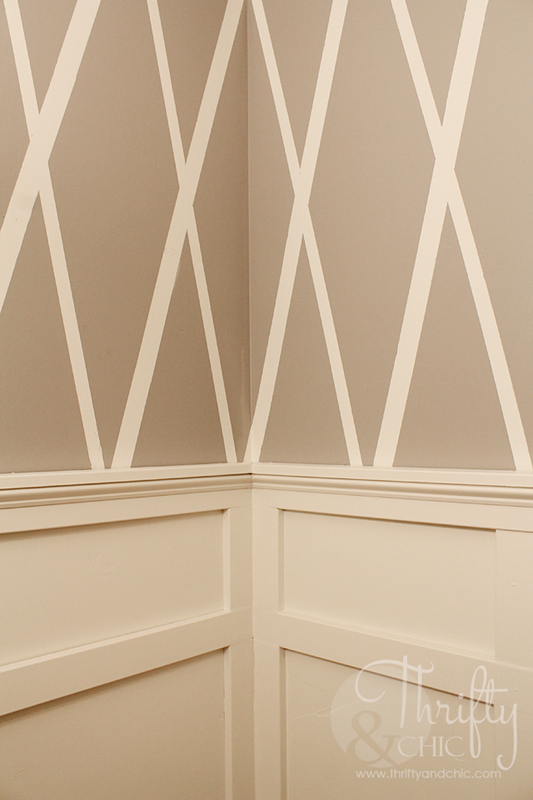 It reminded me of the wall paint of some boutique hotels I've been to before. Great job here!